Sad but true: Sometimes search-and-rescue operations become recovery missions. Whether it’s a missing person, a cold case, a crime scene or a natural disaster, cadaver dogs apply their finely tuned noses to pinpoint the location of remains that help solve mysteries and bring closure to grieving families. 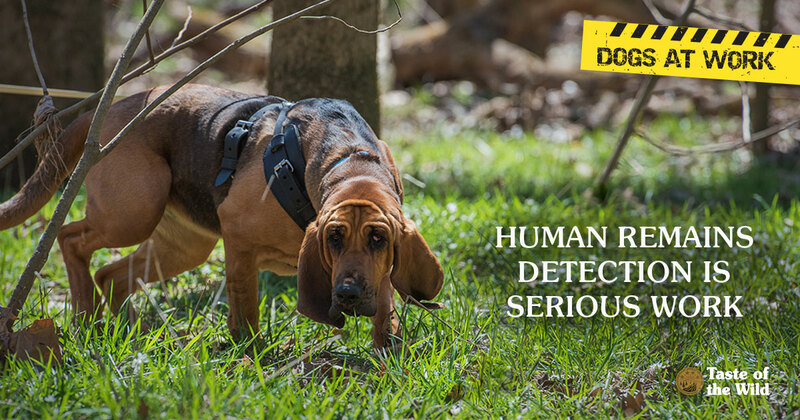 Also known as human-remains detection dogs, cadaver dogs are trained to track down the scent of decomposing human bodies or parts, including blood, bones and tissues. Dogs can find those buried deep in the ground or under collapsed buildings. Many can even explore lakes and rivers from boats, detecting drowning victims underwater. Even when a body has been moved, some dogs can identify residue scents that indicate a body was once in that location. Who would apply for such a gruesome job? Obviously, it has to be a dog with a superb sniffer. But the best dogs tend to have a nonstop drive to play. Trainers use these dogs’ drive to find a tennis ball or other toy to develop their abilities to search out remains. They also must be physically fit and nimble enough to cover a wide range of terrain, through rain, snow and even darkness, for hours on end. Although Labrador retrievers and German shepherds are generally up to the task, the specific breed isn’t as important as the dog’s energy and initiative to hunt for a scent. Even the most ambitious pups may take 18 months to two years to become fully certified as cadaver dogs. Your own dog, for example, may seem to love all things putrid, but training can be arduous. One reason is that there are literally hundreds of different scents that are associated with decaying bodies. A fresh body will smell different than one that’s been dead for 20 years. Flesh also rots differently in open air than does underground. Bodies decompose in different stages, emitting numerous different scents at each stage. Since trainers may not have access to dead bodies on a regular basis, they often start puppies on synthetic scents. And yes, there’s actually a company that produces “corpse scent” available in three formulations: recently dead, decomposed and drowned victim. Dogs are generally trained with positive reinforcement techniques, meaning they are lavished with treats or praise for finding and alerting handlers to the scents. To prevent dogs from digging or jumping at the site of the scent, potentially destroying evidence, they’re usually taught to notify their handlers by calmly laying down or sitting. Eventually, though, dogs must be exposed to the real thing. If trainers can’t obtain human blood and or remains, they can bring dogs to outdoor forensic decomposition laboratories where dogs are exposed to actual dead bodies. Once pups are certified as cadaver dogs, they still need to undergo regular training to maintain their skills. That way, they’re always ready to put their noses to good work, even under the most unfortunate circumstances.